Back cover blurb: ONE MAN'S TRUTH IS ANOTHER MAN'S LIE. When big-shot literary agent Peter Katz receives an unfinished manuscript entitled The Book of Mirrors, he is intrigued. The author, Richard Flynn is writing a memoir about his time at Princeton in the late 80s, documenting his relationship with the famous Professor Joseph Wieder. One night in 1987, Wieder was brutally murdered in his home and the case was never solved. Peter Katz is hell-bent on getting to the bottom of what happened that night twenty-five years ago and is convinced the full manuscript will reveal who committed the violent crime. But other people’s recollections are dangerous weapons to play with, and this might be one memory that is best kept buried. The Book of Mirrors is an intriguing novel of three parts. For me, Part One was the best and held my interest the most, which sadly waned as I got further into the novel. Richard Flynn is a wannabe novelist writing his memoirs in Part One. When they land on the desk of big shot literary agent Peter Katz, he immediately wants to know more and attempts to contact Richard, whose manuscript has been delivered unfinished. But getting hold of Flynn is going to prove more difficult than Katz could imagine. The reason for his intrigue? Flynn claims to know exactly what happened in the late 1980s to Professor Joseph Wieder, a long unsolved brutal murder. But Flynn's story is only the beginning, and as the novel splits into its 2nd and 3rd parts we begin to wonder if anyone really knows the exact truth about the Professors death. 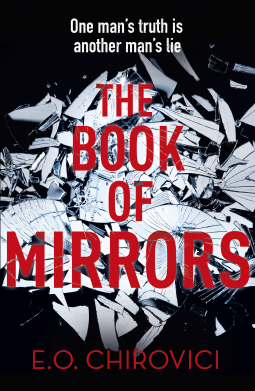 Packed full of unreliable characters, the Book of Mirrors has lots of twists to satisfy most thriller readers, but sadly for me it fell a little flat. Still, an enjoyable read. Just don't expect a lot of 'wow' moments. Having said all the above, I have seen mixed reviews for this, so you may just love it...! The Book of Mirrors is available now via Amazon online and all good book shops.